Ontario Ovens Inc. has a wide variety of laboratory freezers available for everything from epoxy storage to cold temperature testing various materials. Ranging in size from 27 to 76 cu.ft. and -20C to -40C. Because we specialize in thermal processing applications to companies around the world, we have the expertise to help you find the proper laboratory freezer for your application. Units are available for general purpose lab storage, pharmacy, flammable materials storage, explosion proof or hazardous location and blood bank. All our lab freezers come equipped with digital temperature display, internal shelving, cfc-free refrigerants and insulation, adjustable legs and can be equipped with a number of optional accessories including chart recorders, alarms (included on the general purpose freezers), access ports and more. All laboratory freezers are tested prior to shipping and covered by a toll-free help line, 18 month parts and labor warranty and local service support! Ideal for general purpose storage down to -30C. At Ontarioovens, we understand the laboratory environment and the various operating settings involved here.Our low profile laboratory freezer models are designed for safe, easy access to interior chambers. 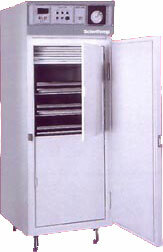 The cabinet lid on the laboratory freezer helps to protect the contents in the laboratory freezer .The lab freezer lid characteristics are 'CFC free' insulation and a positive door latch. The laboratory freezer units have double door gaskets made from silicone compression and magnetic sealing to minimize frost build up thus guaranteeing a highly efficient lab freezer.